Born in 1963 in Russia, Alex Dobrowsky showed talent at an early age, resulting in his attendance at The Academy for Gifted Children and later at the Repin Academy of Fine Arts, both in St. Petersburg, Russia. Later he studied with artist, Suvorov. He has developed a figurative style in oil reminiscent of French artist Paul Chagall that is primitive, yet sophisticated. 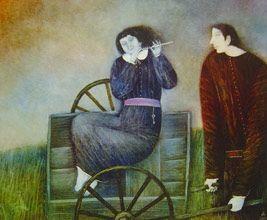 His subject matter seems sentimental as it includes Russian folk images of musicians and peasants. Whimsical images of figures, both at rest and play, set in muted landscapes celebrate the past and remind the viewer of the days before high technology. Alex Dobrowsky has repeatedly demonstrated his innate artistic talents through his numerous exhibitions around Europe.